Another guest tried to go south and found that many trails were not open near the forks as they were still too wet in that area. SO if you come up to ride, check with the trail master before venturing out. And BTW, we have a great new 3 season map provided by the Border Riders Club which has the ATV trails, hiking and biking trails listed on it. They are free for anyone but donations are of course, appreciated. Reports from guests so far are varied. A couple who went north yesterday (over 60 mile ride) said the trails were fantastic and they had an excellent ride. The weather is perfect. I sat on our deck this morning to have my coffee and listened to the morning come to life…that is to listen to the birds. May 10 “”Ice is out!!!! May 9 Ice out update! Let me start with how the lake looked yesterday. 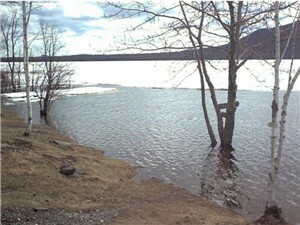 There was open water on both sides of the lake with patches of water throughout the ice in the center. Then the winds started; high winds, which continued most of the day. We could see white caps on the water at the other side of the lake. As the winds continued, it seemed like the ice on the west side was jumping on top of itself. By last night, I was amazed to see how much open water there was…except of course for a couple hundred feet along the eastern shoreline. This morning I woke to a calm almost clear lake. The sky and mountains were reflecting off the calm waters. 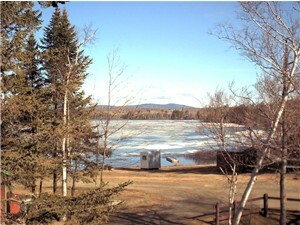 It looks like, from what I can see this morning, that there are only a few ice sections over the whole lake. So where did it go over night? Did it melt? Does it sink? The good news for all of you fisherman is I believe that it should be all gone by tomorrow, perhaps even by later today? We-ll let you know! BTW, this morning I heard the first calls of the loons…yeah! May 6th Ice out update! The weather yesterday morning was not good for a photo shot but let me tell you…the ice is definitely beginning to move. You can see patches of water now all throughout the ice. And I believe that the ice by the river outlet has already moved on. At least it looked that way last evening. Today the sun is up and I think it is going to be a gorgeous warm day. I believe the ice just needs a little more nudge and it will be gone. Below are a couple shots I took this morning…again, hard to really see clearly how the ice is breaking up on film. One shot is the front of our cabins the other is looking out toward the river outlet. No photo today but the ice continues to thin out and it is getting darker and darker. You can even see pools of open water scattered throughout the ice. Not widespread yet, but as long as it is beginning to break up. Seems like last year, the ice looked about like it does today then all at once, the ice was gone. Another good thing in our favor, it is very windy so this should help move it along. Usually by this time, open water fisherman are scrambling for their luresÃƒÂ¢Ã¢â€šÂ¬Ã‚Â¦but not yet this year. But the way it looks, the ice is very dark in areas and what we can see from shore, is thin….so there is a good chance “”Ice out”” may be later this week. 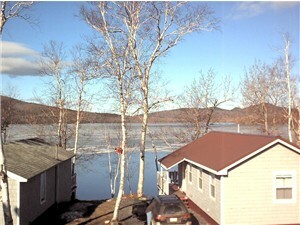 This is a shot we took from Cozy Cove Cabins today. It looks whiter and thicker than it really is! And, as you can see, open water fishing is possible in our yard. 😆 Our shoreline is about where the ice starts. 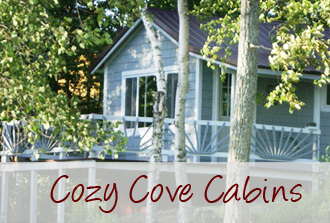 Today begins our 4th year here at Cozy Cove Cabins. I cannot believe we have been here 3 years already. Time has passed so quickly. And we still love it. Every day seems like we see something new and beautiful. And Happy Cinco de Mayo…I guess it is time for a Margarita!